Next week, a supplemental fund for the food stamp program will run out. What happens next? What will happen to SNAP benefits come Nov. 1? As the government begins to wake its shaky legs from the 16-day shutdown, recipients of the Supplemental Nutrition Assistance Program (SNAP) are starting to find out what happens Nov. 1, when extra funding for SNAP runs out. SNAP, the program behind food stamps, received an increase in funding thanks to the Federal Recovery and Reinvestment Act (ARRA) on April 1, 2009, increasing benefits by 13.6 percent, based off a June 2009 assessment of "cost of food." The increase, which allowed a one-person household to receive a maximum of $200 a month for food, will end Oct. 31, 2013. Instead, the amount allotted for certain households will depend on what the USDA has calculated as the "cost of food at home" for June 2013. The Official USDA Food Plans, which calculate the cost of preparing a nutritious diet at home based on recommended dietary guidelines, found that on a "thrifty" plan, a male between 19 and 50 years old needs $182 to eat healthy for a month. Translated to benefits, this means a single-person household receiving the maximum benefit of $200 a month will receive $189 a month, an $11 difference. A two-person household will receive $20 ($347 instead of $367) and so on. The minimum benefit payment of $16, in the meantime, will decrease by $1. Of course, every receiver will have a different allocation based on age, income, and more eligibility factors, regardless of the state. Benefit decreases will hit SNAP receivers Nov. 1, but SNAP will not disappear. 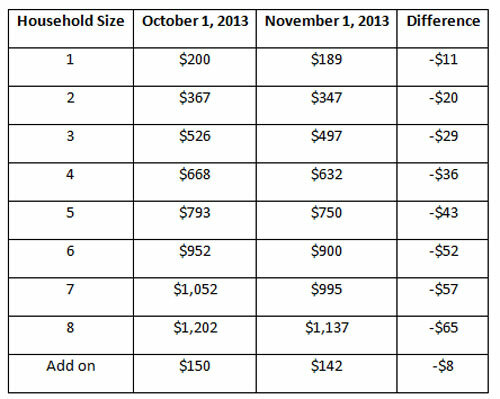 Here's the table comparing the maximum benefit changes come Nov. 1.